We feel good about our running backs as we have them right now, and we will continue to see how they progress. Look, many of us here are regular marines… I will die as a marine because that is my dream. But if you look at teams that want to share more revenues, they’re teams that don’t have a lot on the table. They’ve long since not had any serious investment in their team. Jerral Wayne Jones Sr. was born in Los Angeles, California, USA. 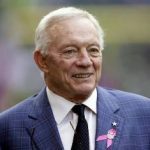 He is an American businessman, best known for being the owner, president, and general manager of the Dallas Cowboys National Football League team. In 1989, Jones purchased the Cowboys from H.R. "Bum" Bright for $140 million. The Cowboys won the Super Bowl in the 1992 and 1993 seasons. During Switzer's tenure, the Cowboys also won the Super Bowl in the 1995 season. He studied at the University of Arkansas. He married to Eugenia "Gene" Jones. They have three children: Stephen, Charlotte, and Jerry, Jr.